In line with its commitment for environmental sustainability, Cocoon Boutique Hotel in Quezon City, Philippines is registered with the USGBC, and is pursuing Leadership in Energy and Environmental Design (LEED-EB) certification that will confirm its sustainability through its policies and practices.  Cocoon Boutique Hotel is in the top 1% on TripAdvisor worldwide receiving for the fifth year the 2018 Travellers' Choice award - the highest honor given by TripAdvisor based on the reviews and opinions of travelers worldwide. 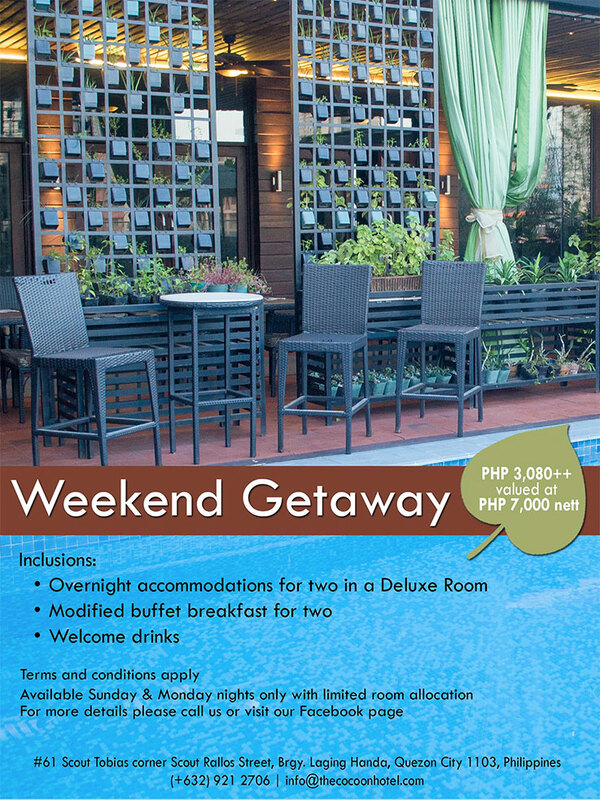 It has maintained its Number 1 spot among Quezon City hotels, and among the top 25 hotels in the Philippines. The Luxury Travel Guide Awards is an international awards program celebrating and rewarding innovation and excellence in hotels regardless of size or location across many categories selected by their affluent subscriber base. Cocoon Boutique Hotel, the only DOT certified 4-star hotel in the heart of Quezon City is awarded Luxury Green Hotel for 2016 in their Asia & Australasia Awards, following the same award received for 2015 in their Global Awards. 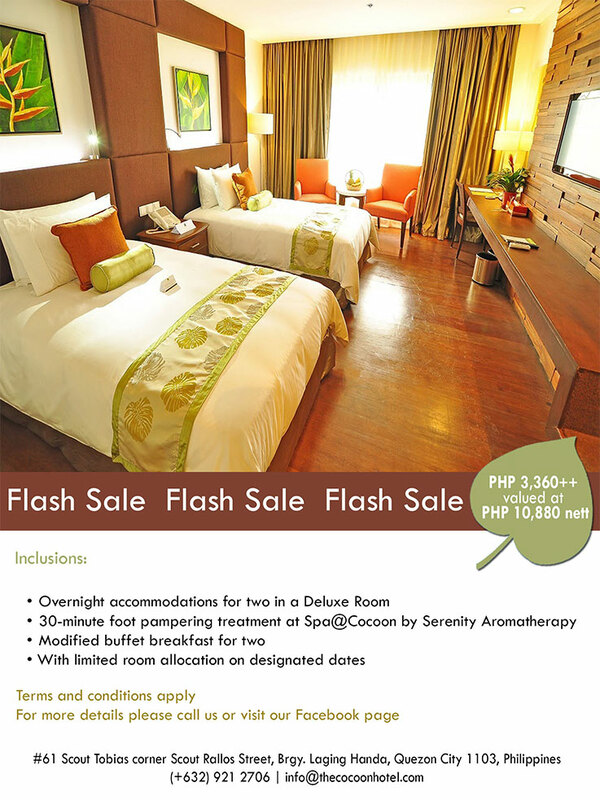 It is the only hotel in the Philippines to receive this award. 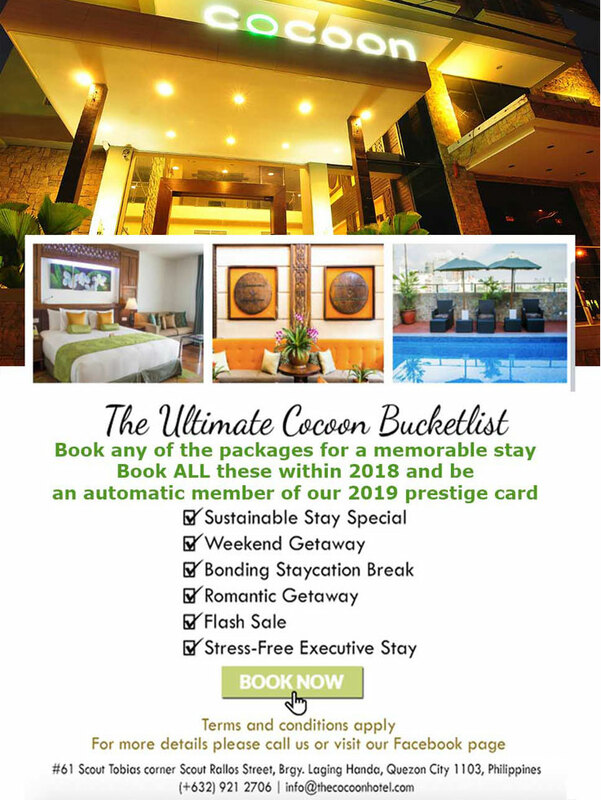 We welcome you to Cocoon Boutique Hotel in Quezon City, the first and only deluxe boutique hotel in the Philippines that is truly green. 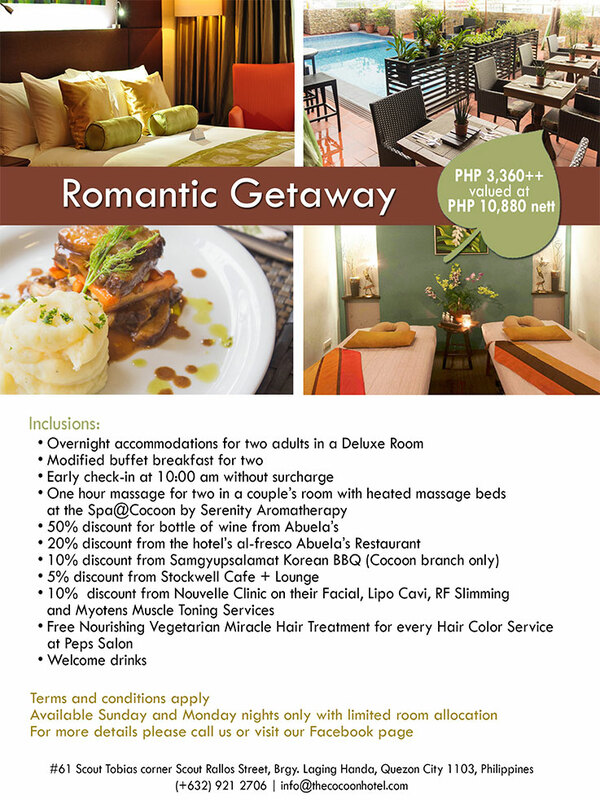 A nurturing urban location that feels like a resort in Quezon City. We offer you redefined luxury, one that is sustainable and responsible, yet undiminished. 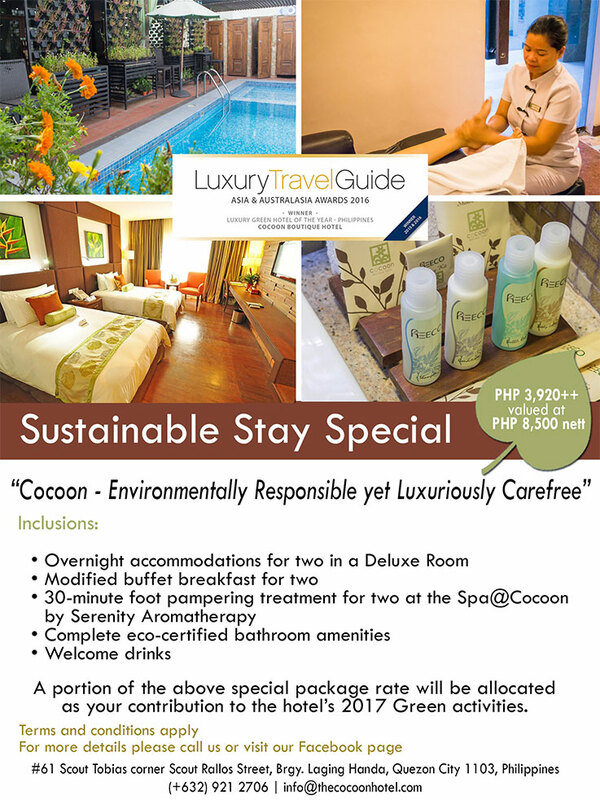 As you enjoy Cocoon’s deluxe amenities for business or staycation, meeting venue, or events venue, you are able to contribute towards caring for the environment. A place that you can proudly call HOME - where luxury is responsible. 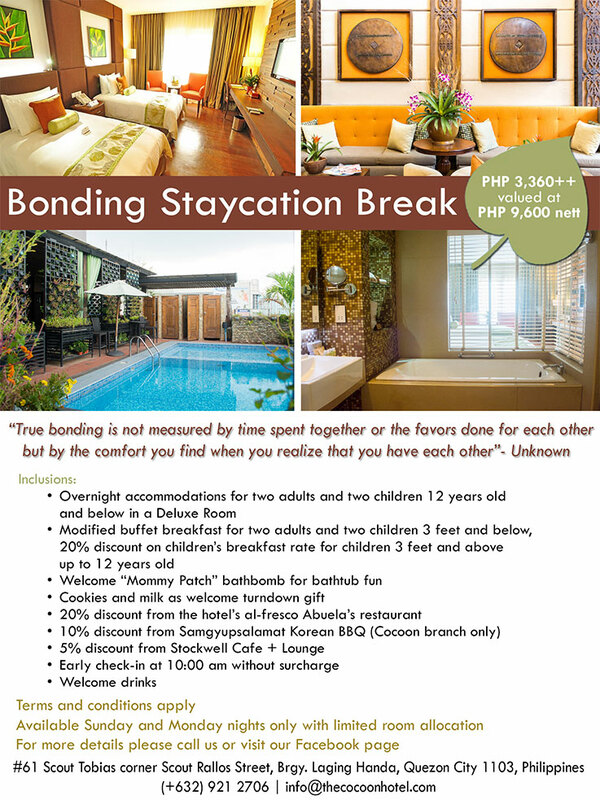 Among hotels in Manila, Cocoon provides best value for luxury boutique hotel amenities and services. Special promo rates are offered so you can enjoy our staff's sincere, warm, and nurturing service while taking pleasure in our redefined sleep and bath experience. 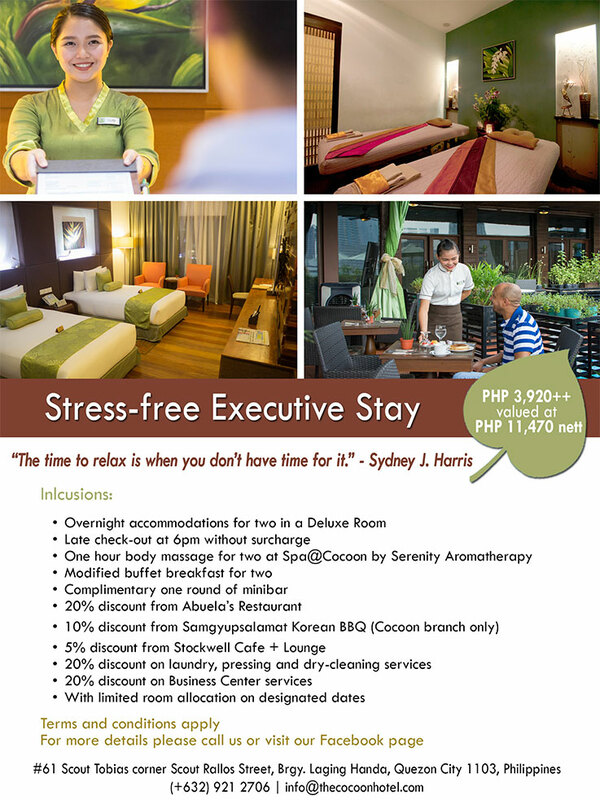 Affordable rates for worldclass facilities and service, rated by regular clients as a '5-star hotel in Quezon City’. We offer expert servicing in our distinctive hotel function rooms and halls: from formal board meeting venue, to casual corporate events venue, to worldclass conference rooms in the heart of Quezon City. Celebrate your milestones – weddings, debuts, birthdays, special corporate events and more, where you are assured of the most memorable momentous occasions. Cocoon is the most ideal party venue in Quezon City. Replicate that exclusive luxurious staycation hotel experience at Cocoon in your own home. By insistent demand from our discriminating hotel guests, we offer this limited collection of deluxe materials designed to pamper them.